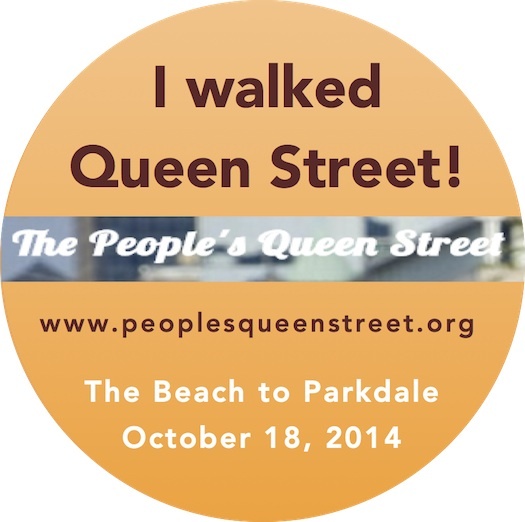 Join us Saturday, October 18 at 10:00 am for the People’s Queen Street Walk in partenrship with Momentum1’s Toronto Trails Festival to “map Queen Street with our feet.” We’ll enjoy an experiential exploration of the pedestrian realm from The Beach Village to Parkdale, Toronto. Walk with us all the way from Neville Park to Roncesvalles and make it an urban walking “daycation.” Or join us along the way: we’ll be stopping at Queen & Broadview at Noon remarks from Streetcar Developments (lunch break), Campbell House (Ossgoode) at 2 – 2:30 pm, and a stretch at Trinity Bellwoods at 3:15 pm, arriving at “Roncy” at approximately 4:30 pm. Post walk drinks at The Sister, 1554 Queen St West. 10:00 AM – Welcome and Walk Kick-Off at the Neville Park & Queen Street East. Walkers are encouraged to comment, photograph and give feedback on the pedestrian realm as we enjoy the daycation: how are the sidewalks, the way parks meet the street, how could Queen Street be a better home to walkers and encourage active transportation? Walk through The Beach Village, Greenwood, Leslieville to Riverside. 12:00 Noon – Arrive at Broadview & Queen – Remarks from Streetcar Developments on their plans for Riverside Square & the New Broadview Hotel. 12:15 pm – Lunch break. Enjoy the opportunities for a quick bite in the Riverside neighbourhood – (a list will be supplied to walkers). If you are joining us at Broadview and Queen – please arrive by 12:45 pm. 1:00 pm – depart for Campbell House – walking via Corktown, Moss Park, downtown, Nathan Phillips Square. 2:00 pm (approx.) arrive at Campbell House. Campbell House staff will be available to answer questions about the historic building. Enjoy the grounds. Stretch. Grab a coffee at the nearby Starbucks. If you are joining us at Campbell House please arrive by 2:30 pm. 2:30 pm – depart from Campbell House for Trinity Bellwoods Park via Queen Street West, West Queen West. 3:15 (approx.) arrive at Trinity Bellwoods – stretch break. 3:30 pm – depart for Parkdale. 4:30 pm (approx.) – arrive at Beaty Boulevard Parkette – Queen & Roncesvalles.